THE SKINNY: Have you ever tried a product and could not decide whether you love it or actually hate it? That's the situation I am facing with Anatomicals You Need A Blooming Shower Gel. The sudsy gel cleans well and leaves my skin feeling fresh. I just can't decide if I love or hate the scent. It has an artificial rose smell, which I admit sounds pretty bad. But some days I just really like it. It reminds me of my childhood somehow. So I am wondering if anyone else has tried this one out. Let me know what you think in the comments or on Facebook. KEEP OR TOSS: Keep. I'm still debating. 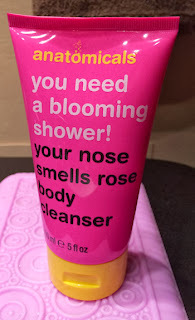 CHECK IT OUT: This Anatomicals product came in a recent Glossybox.